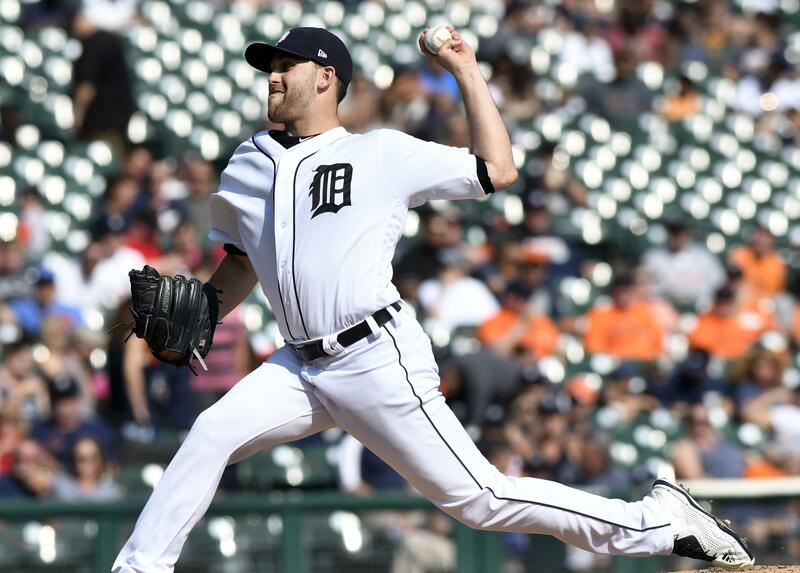 UPDATED: Sun., Sept. 17, 2017, 10:05 p.m.
DETROIT – Matthew Boyd’s no-hit bid ended when Tim Anderson doubled with two outs in the ninth inning, and the Detroit left-hander closed out a one-hitter for the first shutout of his professional career in a 12-0 win over the White Sox on Sunday. Boyd (6-10) allowed only two runners – a walk to Rob Brantly in the third and Anderson’s double to the gap in right-center field with two outs in the ninth. He struck out five and threw 121 pitches – his big league high. Dylan Covey (0-6) allowed five runs, seven hits and four walks in 3 2/3 innings. Nick Castellanos, Mikie Mahtook and Jeimer Candelario homered. WASHINGTON – Stephen Strasburg ended his club-record scoreless streak at 35 innings, but two home runs from Ryan Zimmerman helped the All-Star win his fourth consecutive start as Washington beat Los Angeles. Strasburg (14-4) allowed a run in the second inning on Logan Forsythe’s double, the first against the right-hander since Aug. 19. He struck out eight and combined with three relievers to toss a five-hitter. The Nationals avoided a three-game sweep against the N.L. frontrunners. Washington’s slumbering offense came alive on Zimmerman’s three-run shot in the sixth off reliever Ross Stripling (3-5). Zimmerman and pinch-hitter Adam Lind homered in the eighth. Los Angeles lost 11 in a row and 16 of 17 before ripping off four consecutive wins, including the first two games this series. The Dodgers magic number to clinch the N.L. West dropped to four when second-place Arizona lost at San Francisco. ST. PETERSBURG, Fla.– David Price pitched two hitless innings in his first big league game since July 22 after being sidelined by left elbow inflammation. The 2012 A.L. Cy Young Award winner made his first relief appearance since 2010. Jake Odorizzi (9-8) gave up one hit in six innings, a Jackie Bradley Jr. home run. Jesus Sucre hit a tiebreaking solo home run off Eduardo Rodriguez (5-6) in the sixth. Alex Colome pitched the ninth for his major league-leading 45th save. Tampa Bay remained 5 1/2 games behind the Twins. DENVER – Rockies closer Greg Holland dropped the ball trying to tag Matt Szczur at home on Austin Hedge’s squeeze bunt in the ninth inning, allowing San Diego to finish its rally and beat Colorado. Hedges bunted back to Holland (3-6) with runners at the corners and one out, but after making a nice play to scoop up the ball, Holland lost control trying to tag a sliding Szczur. Colorado’s bullpen blew its first save in three weeks and let the Rockies’ lead for the second N.L. wild card shrink to 2 1/2 games over Milwaukee. The Brewers beat Miami on Sunday, and St. Louis, which lost to the Chicago Cubs, stayed 4 1/2 back. Kirby Yates (4-5) pitched the eighth, and Brad Hand got the last three outs for his 18th save. NEW YORK – Ubaldo Jimenez (6-1) struck out 10 in just five innings, and Tim Beckham hit a three-run homer off Sonny Gray (9-11), who allowed five runs in four innings during his shortest start this season. Didi Gregorius homered for the third straight day as New York’s four-game winning streak ended. The Yankees remained three games behind A.L. East-leading Boston and four games ahead of Minnesota for the top AL wild card. Baltimore, which had lost nine of 10, is 5 1/2 games behind the Twins. With two outs and a runner on third in the ninth, Zach Britton intentionally walked Aaron Judge, then struck out Gary Sanchez for his 15th save. MINNEAPOLIS – Eddie Rosario homered twice, Joe Mauer hit his first grand slam at home and Minnesota overcame a 5-0 deficit with seven runs in the second inning and six in the fifth. Minnesota reopened a two-game lead over the Los Angeles Angels for the second A.L. wild card. Kyle Gibson (11-10) allowed five runs, three hits and five walks in six innings. Joe Biagini (3-11) gave up six runs – four earned – and five hits in 1 1/3 innings. Josh Donaldson homered twice in the first two innings. ANAHEIM, Calif. – Joey Gallo hit a home run off Garrett Richards (0-2) that landed near the top of the grass hill in center field in the second inning, a drive that would have traveled 490 feet unimpeded, according to MLB Statcast. Adrian Beltre hit a two-run double to center field in the first. Miguel Gonzalez (8-11) allowed one run and two hits in five innings, and Jake Diekman got five outs for his first save this season. CLEVELAND – A day after Cleveland clinched the AL Central, Corey Kluber (17-4) allowed three singles in seven innings. He has not given up a run in 22 innings and has lost once since July 4. Edwin Encarnacion hit a two-run homer in the fourth off Danny Duffy (8-9) as the Indians improved to 33-5 since Aug. 11 despite getting only three hits. Cody Allen worked out of a two-on jam in the ninth for his 28th save. Kansas City dropped five games behind the Twins. CHICAGO (AP) – Jason Heyward hit a tiebreaking RBI single off Matt Bowman with two outs in the seventh as Chicago overcame a 3-0 deficit to win its sixth straight game. The Cubs remained four games ahead of second-place Milwaukee as Ben Zobrist drove in two runs and Kyle Schwarber hit his 27th homer. Pedro Strop (5-4) worked a rocky seventh for the win and Wade Davis got three outs for his 31st save, retiring Dexter Fowler on a game-ending flyout to the warning track with a runner on first. Tyler Lyons (4-1) was the loser. MILWAUKEE – Travis Shaw, Jesus Aguilar and Manny Pina each had two hits in an eight-run fourth inning. The Brewers won two of three in a series moved from Florida following Hurricane Irma. Brandon Woodruff (2-2) allowed three runs and eight hits in seven innings. Dillon Peters (0-2) yielded eight runs, nine hits and three walks in 3 2/3 innings. CINCINNATI – Eugenio Suarez and Scooter Gennett hit two-run homers in the sixth off Gerrit Cole (11-11) as Cincinnati completed its second three-game sweep of Pittsburgh this season. Robert Stephenson (5-5) allowed one hit in six scoreless innings, and Michael Lorenzen pitched a perfect ninth for his second save. PHILADELPHIA – Joey Wendle hit a go-ahead grand slam off Edubray Ramos after the first two batters in the sixth reached off Henderson Alvarez (0-1), who made his first start since May 22, 2015, with Miami. Sean Manaea (11-10) gave up three runs in five innings, and five relievers combined for four hitless innings. Blake Treinen got three outs for his 11th save. ATLANTA – Robert Gsellman (7-7) allowed an unearned run and three hits in seven innings, pinch-hitter Asdrubal Cabrera had a two-run, pinch-hit homer. Atlanta (67-81) was eliminated from postseason contention and must win its remaining 14 games to avoid a losing record in four straight seasons for the first time since seven in a row from 1984-90. Julio Teheran (11-12) gave up two runs, three hits and four walks in six innings. had won 20 of 25 games and nine straight on the road. Taijuan Walker (9-8) Walker gave up four runs and seven hits in five innings. HOUSTON – Justin Verlander struck out 10 over seven innings in his first home start for Houston, Derek Fisher and Marwin Gonzalez homered in a big fifth inning and the Astros clinched the American League West with a win over the Seattle Mariners for their first division title since 2001. George Springer and Carlos Correa also homered for the Astros, who won their first division title since 2001 and seventh overall. The Astros become the first team in major league history to win titles in three divisions after previously winning the NL West and NL Central. Verlander (13-8) retired his first seven batters before Ben Gamel homered into the right-center bullpen in the third. He allowed just two singles after that to improve to 3-0 since he was acquired from Detroit on Aug. 31. Andrew Moore (1-4) allowed three runs and seven hits in 4 2/3 innings. Published: Sept. 17, 2017, 9:29 p.m. Updated: Sept. 17, 2017, 10:05 p.m.